Our festive table awaits the feast at City View. Warning: this article contains calories. Lots of them. All fabulous, so get stuck in. This is a heartfelt homily to City View, the training restaurant at the Shooters Hill Post-16 campus. Five of us dined there last week. It was the first of the school’s Christmas-inspired fine dining events for 2013 and was fully booked, which made for a convivial atmosphere. Someone was having a birthday and we applauded after her friends sang to her. It was that sort of night. The restaurant is tucked away at the end of a long hallway in the campus’ main building. The room is oriented so that most of the 10 or so tables enjoy sweeping views of the twinkling lights of Woolwich, Charlton and beyond. 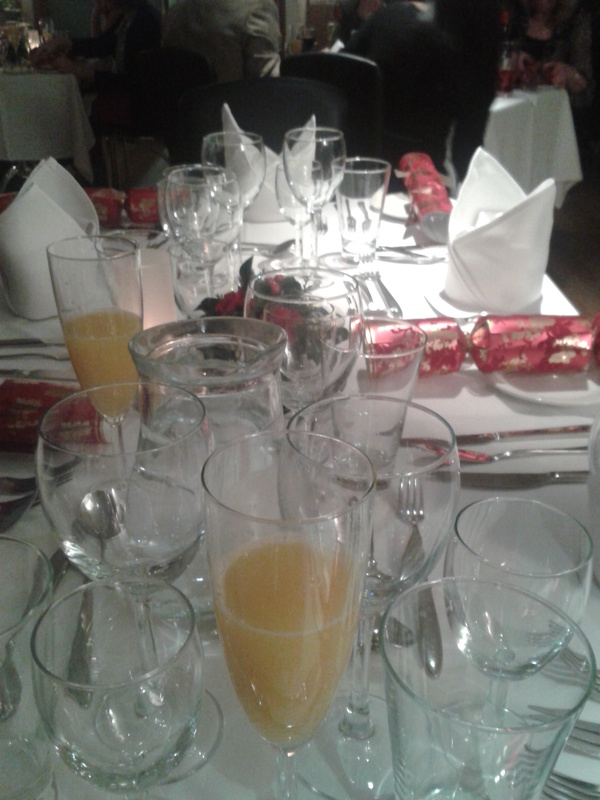 Our table was beautifully set and festooned with Christmas crackers. While we sipped on champagne and orange juice, we perused the respectable wine list, which had all bases covered and was reasonably priced. We settled on a bottle (then another and, why not, another) of Chilean red. The feast kicked off with a couple of small dishes, in the manner of amuses-bouche. The first was a smoked trout blini with beetroot, topped with a vodka-kissed crème fraiche. In short, a sophisticated and seasonal opener. A spinach-filled tartlet with salmon, prawns, and scampi arrived next, its subtle flavours striking a good balance. Our bouches were certainly amused. A superb mulled wine sorbet followed. Imagine a scoop of tangy and fluffy ice-cold sweetness, served in a wine glass, with a mulled-wine reduction draped over it like a festive cloak. If this were available by the litre-tub in shops, the world would be a better place. Now, sit back and loosen your belt while I recall main course. It was paupiette of turkey stuffed with cranberry and sage, served with sprout tops in tempura batter, roasted goose fat potatoes, and a light gravy cheered on by garlic, bacon and chestnuts. A paupiette, I have learned since, is a French dish of meat that has been beaten thin and rolled, and stuffed with vegetables, fruits or sweetmeats. It is popular in Normandy. Dessert was a chocolate brownie made Christmassy by the addition of warm, booze-infused cherries, a winning and rich combination that left us with scant room for the Eccles cakes and Shropshire blue that came out with coffee and handmade chocolates. After dessert, the students emerged from the kitchen and we gave them a well-deserved round of applause. They moved among the tables and chatted to everyone about the food, the catering course, and their plans. On our night, all were in their final year and about to embark on careers or further study elsewhere. They had devised and produced our meals under the tutelage of professional chefs, and were clearly enjoying the chance to showcase skills learned and honed over three years. I hope some of them consider opening up a restaurant in Woolwich, down the track. For details see www.shootershill.ac.uk/restaurant. We paid £28 per head, not including wine (about £10-£16 per bottle). Oh my gosh, this place sounds amazing! Went myself for a Christmas meal here (there was a group of six of us) – it was very good. We had a slightly different menu, but have to back up your comments – food, service and atmosphere great. Thanks for your comments! We’ll be back soon, for sure.